As you explore the Black Rock Desert-High Rock Canyon Emigrant Trails National Conservation Area, you’ll find yourself in a wide variety of landscapes, home to many different kinds of plant communities. Here’s a peek at what you’ll see out there. The diverse habitats in the Black Rock-High Rock NCA support hundreds of species of wildflowers. Many are attention-grabbing and dazzling, with large blossoms and stunning colors, while others reward only the most observant eyes. Generally, wildflowers are most abundant at lower elevations early in the season, and at higher elevations later. Every spring, some part of the Black Rock Desert-High Rock Canyon Emigrant Trails National Conservation Area (NCA) puts on a colorful wildflower show. Generally, wildflowers emerge in April and continue blooming into August, but this varies with annual rainfall and elevation. One of the best places to view wildflowers is in the low sagebrush plant communities near Stevens Camp during late May and early June. There is always something blooming here, including brilliant yellow buckwheat, blue lupine and white bitterroot. Although not as dependable, in wet years the barren hills surrounding the Black Rock Desert Playa are awash in the vibrant colors of bee plant, Indian paintbrush, and yellow daisies. Visitors to the hot springs in the vicinity of Soldier Meadows should be on the lookout for basalt cinquefoil, a low-growing herb with bright yellow five-petalled flowers that grows in the moist, alkaline soil near hot springs. This is the only place in Nevada where the basalt cinquefoil is found, so take care enjoy their charm without damaging them or their habitat. Biological crusts grow on or just below the surface of the soil. They can also be known as microbiotic, cryptogamic, cryptobiotic, microphytic, or microfloral crusts or soils. The biological crusts in the NCA are composed of communities of algae, cyanobacteria (blue-green algae), bacteria, lichens, mosses, liverworts, and fungi and their byproducts. 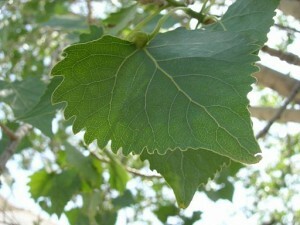 They commonly occur in arid and semiarid environments. Keeping out unwanted plants, such as exotic weeds. Because of their functions in rangeland systems, biological soil crusts can be an indicator of rangeland health. Crusts are well adapted to severe growing conditions, but are extremely susceptible to physical disturbances. Domestic livestock grazing and recreational activities (such as hiking, biking, and offroad driving) disturb the integrity of the crusts. Crust disruption brings decreased organism diversity, soil nutrients, stability, and organic matter. Another indirect physical disturbance occurs through crust burial. When the integrity of the crust is broken, the soil is more susceptible to wind and water erosion. Soil can then be moved long distances, covering intact crusts. Crusts tolerate shallow burial by extending sheaths to the surface to begin photosynthesis again. Deeper burial by eroded sediment will kill biological crusts. Fire can also damage the crust, although recovery depends on the intensity of the fire. 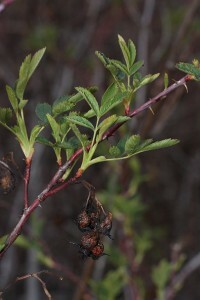 Low-intensity fires do not remove all of the crust structure, which allows for regrowth without significant soil loss. Basalt cinquefoil is a plant found on the moist alkaline slopes surrounding Soldier Meadows springs. 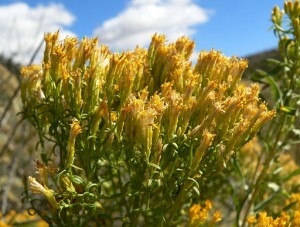 Their bright yellow flowers bloom in late spring and early summer. Although they are able to grow in previously disturbed areas, campsites and vehicle trails near springs have damaged cinquefoil habitats enough that they are currently a candidate for listing as a threatened species. © 2008 Dean Wm. Taylor, Ph.D.
Sagebrush habitat covers much of the NCA, extending from the margins of the intermountain (cold desert) scrub at an elevation of 4,500 feet to the tops of the mountains just below 10,000 feet. Historically, sagebrush habitat contained a high diversity understory of perennial grasses and forbs. 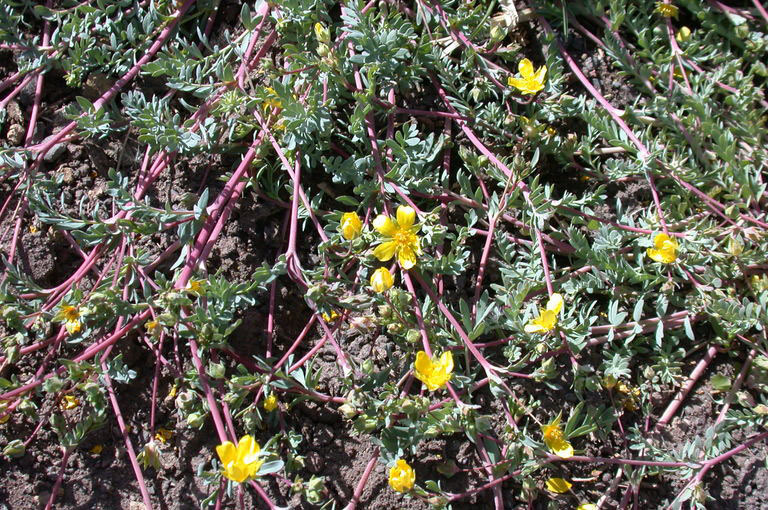 At present, however, these native species have been displaced by cheatgrass (Bromus tectorum) and medusahead (Taeniatherum caput-medusae), invasive annual grasses considered noxious weeds. 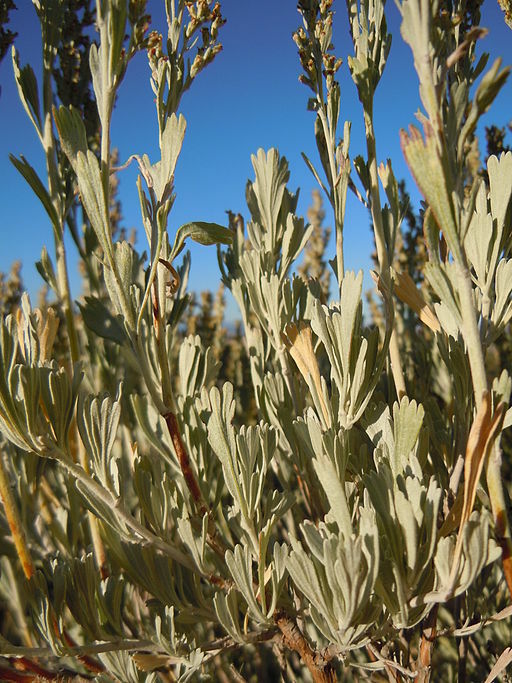 Great basin sagebrush (Artemisia tridentata) is one of the most common sagebrush species at lower elevations, however there are 27 distinct species of sagebrush in Nevada! Other sagebrush species include Lahontan sagebrush (A. arbuscula ssp. 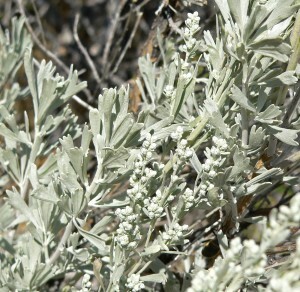 longicaulis), which occurs along the historic shorelines of Lake Lahontan, silver sagebrush (A. cana), alkali sagebrush (A. arbuscula var longiloba), and three-tip sagebrush (A. tripartita). Interspersed throughout the sagebrush are bitterbrush (Purshia tridentata) and rabbitbrush (Chrysothamnus viscidiflorus). In the spring, wildflowers transform the sagebrush landscape into a mosaic of brilliant colors. Impressive wildflower displays can be seen throughout the NCA in the spring. Wildflower species include arrowleaf balsamroot (Balsamorhiza sagittata), buckwheats (Eriogonum spp. ), Penstemon (Penstemon spp. ), lupines (Lupinus spp), wild onions (Allium spp. ), desert parsley (Lomatium spp. ), phlox (Phlox spp. 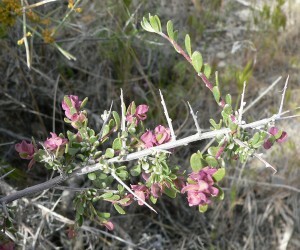 ), loco weeds (Astragalus spp. ), daisy (Erigeron spp and Townsendia spp. 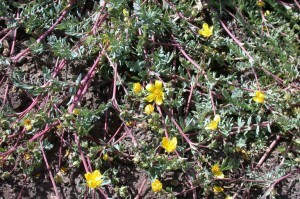 ), evening primrose (Oenothera spp. ), rosy everlasting (Antennaria rosea), false dandelion (Agoseris glauca), tapertip hawksbeard (Crepis acuminatus), and waterleaf (Phacelia spp.) (Shultz 2013). Sagebrush is crucial habitat for the greater sage grouse, pygmy rabbit, sage thrasher, loggerhead shrike, Brewer’s sparrow, sage sparrow, great basin pocket mouse, sagebrush lizard and the sagebrush vole. 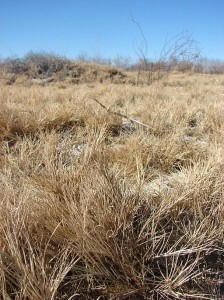 Intermountain (cold desert) scrub occurs in valley bottoms with poorly draining saline rich soil. 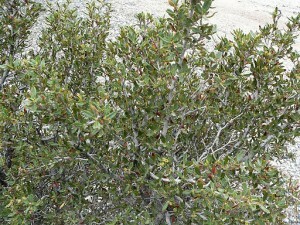 In the NCA, intermountain scrub occurs most commonly on the poorly draining slopes surrounding playas and old lakebeds. 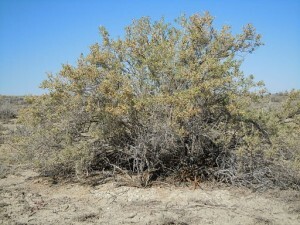 The dominant species within this plant community are the salt tolerant greasewood (Sarcobatus vermiculatus), shadscale (Atriplex confertifolia), sickle saltbush (Atriplex gardneri falcate),Torrey’s quailbush (Atriplex torreyi), spiny hopsage (Grayia spinosa), iodine bush (Allertolfea occidentialis) and indian ricegrass (Achnatherum hymenoides). 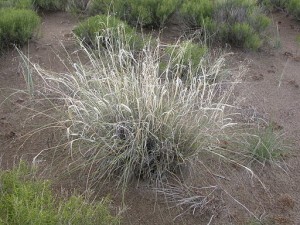 The loose, saline-rich soil within the intermountain scrub often blows in the wind and accumulates around the base of shrubs forming hummocks or small dunes. This habitat is being altered by the invasion of cheatgrass (Bromus tectorum), Russian thistle (Salsola tragus) and tamarisk (Tamarix sp.). 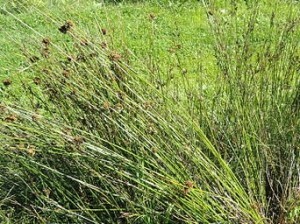 Indian ricegrass provides important food for many wildlife species, but it is no longer as abundant as it once was due to the invasion of these noxious weeds. Intermountain scrub provides crucial habitat for kit fox, pallid bat, long-nosed leopard lizard, Sage sparrow, Brewer’s sparrow, sage thrasher, burrowing owl, pale kangaroo mouse, dark kangaroo mouse, and great basin collared lizard. At first glance, the landscape of the Black Rock region appears to be grey sagebrush or greasewood as far as the eye can see. 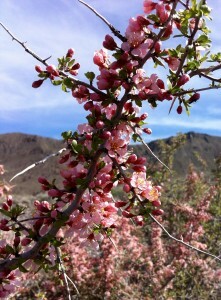 But there are actually thousands of springs and riparian areas scattered across the landscape or tucked away in canyons. The plant community of a spring or riparian area is shaped by geology, aquifer size, geography, climate, and the persistence of water (Abele 2011). Common plant species near springs include saltgrass (Distichilis spicata), Nebraska sedge (Carex nebrascensis) and Baltic rush (Juncus balticus). 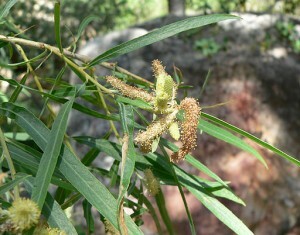 Species commonly found in riparian areas are willow (Salix sp. 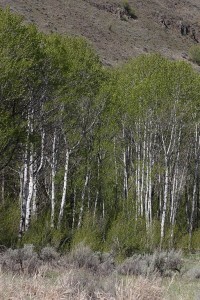 ), aspen (Populus tremuloides), cottonwood (Populus fremontii), mountain rose (Rosa woodsii) and buffaloberry (Shepardia argentea). Springs and riparian areas provide essential water, nesting habitat and food for many wildlife species including bighorn sheep, neotropical migratory birds, several endemic species of springsnails, and the endemic desert dace fish. Although freshwater marsh is uncommon in the NCA, emergent water plants dominate along the edges of manmade ponds and drainage ditches. 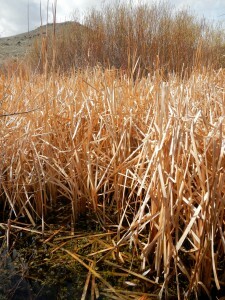 Such areas are usually dominated by cattails (Typha spp.). Cattails can also occur in along slow moving streams. Alkaline meadows occur on valley bottoms with high water tables throughout the NCA. Small meadows are rare in the sagebrush community. Species found within akaline meadows include inland saltgrass (Distichilis spicatus), alkali sacaton (Sporobolus airoides), Baltic rush (Juncus balticus), Great Basin wildrye (Leymus cinereus), black greasewood (Sarcobatus vermiculatus) and rubber rabbitbrush (Ericameria nauseosa). Perennial forbs are generally more common than annuals, with the most common plants including locoweed (Astragalus sp. ), Indian paint brush (Castilleja sp. 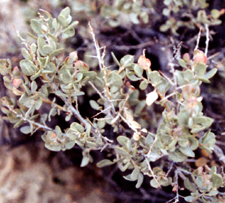 ), buckwheat (Eriogonum sp. ), lupine (Lupinus sp. ), and beardtongue (Penstemon sp.). 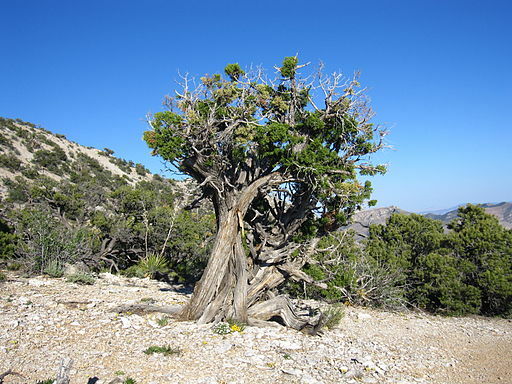 Across the tops of the highest peaks in the NCA, widely spaced Utah juniper (Juniperus osteosperma), and curl-leaf mountain mahogany (Cercocarpus lediofolius) dot the slopes of mountain big sagebrush. 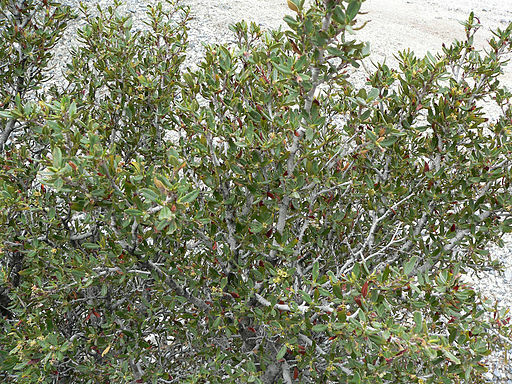 The shrub community here includes snowberry, serviceberry, Stansbury cliffrose, and bitterbrush, which provide important forage for mule deer. Utah Juniper woodlands also provide important habitat for Pinyon jays, mule deer, bighorn sheep and ferruginous hawk.